Constraints are natural and convenient way of describing various types of relations between parameters. 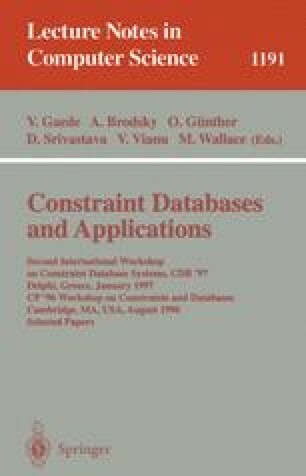 It's generally accepted that constraint systems can benefit to DB-systems. First they could be used for query optimization (by reducing the number of objects to be tested) both in traditional DB-systems and in databases with modern features like spatial or constraint indexes. In the former case the combination seems to be most reasonable since DB provides efficient way of handling and storing constraints which perfectly could be solved by ID-Library. ID Library was tested on a lot of benchmarks for non-linear constraints solvers from different papers [DD96]. At present various engineering optimization problems are under development on the base of the ID library. The integration of ID library into ECLiPSe was fulfilled in IC-PARC (Imperial College) and ICL, London. It was possible thanks to the support and help of W. O'Riordan, M. Rigg and M. Wallace. Our gratitude to all of them.